Homeland Security Secretary Kirstjen Nielsen said Thursday that there is no "intention right now to shoot at people" from a Central American migrant caravan if they cross the United States border. In an interview with Fox News on Thursday, Nielsen appeared to confirm reports the Trump administration is considering sending 800 active-duty troops to the southern border. NBC News reported Thursday that the Trump administration is drafting an executive action that would make it exceedingly difficult for Central American migrants seeking asylum to gain entry, according to three sources familiar with the proposed measures. In the interview, Nielsen was asked whether U.S. personnel would ever open fire if people "force their way" through. "We do not have any intention right now to shoot at people. They will be apprehended, however," she said. "But I also take my officer and agents, their own personal safety, extraordinarily seriously. They do have the ability of course to defend themselves." Asked whether officials would return fire if shot at, she said, "No," before adding, "I think we'd have to work through that. But I want to make it very clear we will absolutely not tolerate violence against border patrol in this situation." The Associated Press cited a U.S. official as saying Defense Secretary Jim Mattis is expected to sign an order sending some 800 troops to the border, bolstering the 2,000 National Guard forces already there under a previous Pentagon arrangement. Asked whether she could confirm the 800 figure, Nielsen told Fox News, "Sure ... We've asked for some air support, for some logistics, some planning, vehicle barriers, engineering, ways in which I can protect my officers and agents as well as the ports of entry themselves." Nielsen said it would be up to Mattis whether the personnel were armed. "The rules of engagement for us are the same as they've always been," she said. "For DoD, we're still in discussions and we're working them out. 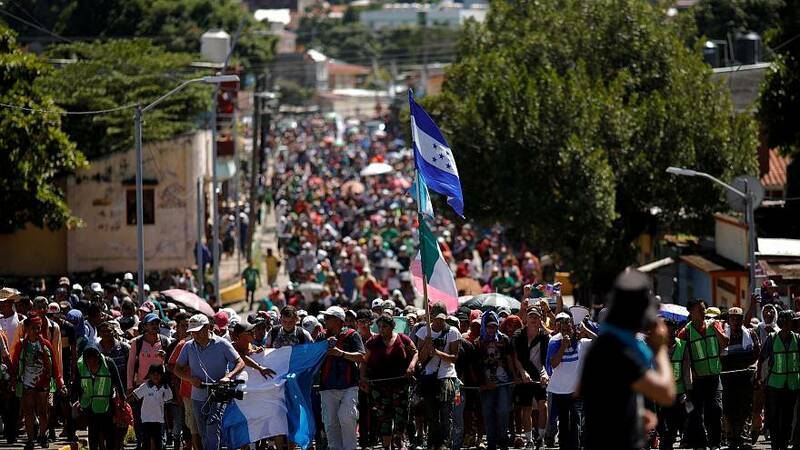 We're waiting to see what the caravan's going to do, what numbers are looking like, where they're headed." President Donald Trump made immigration a central issue ahead of next month's midterm elections, and tweeted about the caravan Thursday. Last week in the White House, Nielsen became involved in a heated discussion over the caravan, according to two people familiar with the meeting. Nielsen was explaining an 80 percent rise in immigrant families crossing the border when National Security Adviser John Bolton interrupted her to criticize her handling of the issue, the people said. Bolton said that Nielsen was doing a poor job with the border and that her department was not producing the needed results, these people added. He argued that she was failing at one of her signature tasks as Homeland Security secretary, they said. This prompted a heated exchange between Bolton and White White House Chief of Staff John Kelly, according to the sources.